Species 5 or 6, chiefly in Europe and Asia. Type species: Milium effusum L.
Milium effusum L. Sp. PI. 61. 1753. 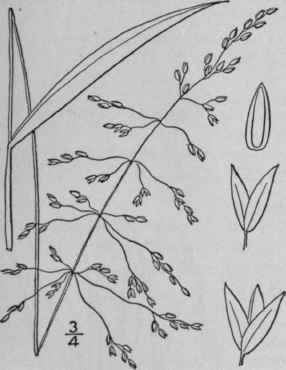 Glabrous throughout, culms 2°-6° tall, erect, simple, smooth. Sheaths shorter than the internodes; ligule 1 1/2"-3" long, truncate, erose-dentate; blades 3'-g' long, 3"-8" wide, narrowed toward the base, acuminate, smooth or scabrous; panicle 3'-10' in length, lax, its branches 2'-3' long, slender, somewhat flexuous, naked at base and dividing above the middle, at length widely spreading; spikelets 1 1/4"-1 1/2" long; outer scales equal, smooth or scabrous, the third scale shorter, smooth, white. In woods, Cape Breton Island to Ontario, south to Massachusetts, Pennsylvania and Illinois. Also in northern Europe and Asia. June-July.